If it’s one thing I’m extremely interested in it’s anti-aging, and supplementing with AC-11 helps repair your DNA. I’m a certified anti-aging junkie….being in my mid 30’s I’m all about taking care of myself and fighting the aging process every step of the way something that was told to me by my mom when I was in my mid 20’s. Why not? I would like to keep my skin looking youthful and my body feeling good for as long as possible! While good skin care is an essential part of any anti-aging routine (your skin is your largest organ), another major factor is treating your body from the inside. Yes, science has brought us new technology that’s made it possible to repair our DNA and those pesky cells that continue to age us and express diseases. If your one of those who says ‘grow old gracefully’ then I respect you for that. I would personally love to stay youthful and keep my body healthy for as long as possible. Supplementing with AC-11 seems like a fast track for reversal of aging cells so I’m all about it! Safe, all natural and water soluble AC-11™ is a powdered, bioactive rainforest plant extract that, when ingested as a dietary supplement or applied topically as a cosmeceutical, helps the body to repair sun and environmental stress-related damage to DNA, and slow down the process of skin aging. A gift from the rainforest, AC-11™ is the perfect joining of nature’s secrets with advanced phytonutrient science. What is AC-11 DNA Repair and What are the Anti-Aging Benefits? Here are some highlights about DNA repair and AC-11. 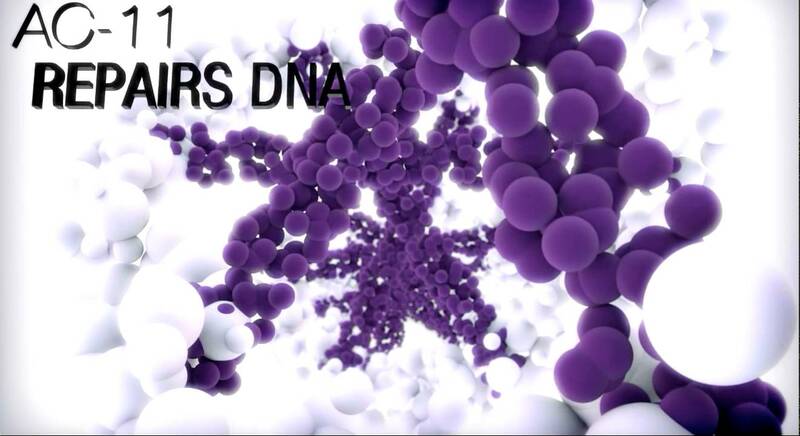 DNA carries our genetic codes and is the most important molecule in the body. Damage to DNA is the basis for aging and disease. As we age, we lose collagen rapidly. By age 30, our collagen production has already decreased by almost 50%! AC-11 also normalized the expression of NF-KB in the cells, thereby regulating cellular response to inflammation (an over-expression of NF-KB heightens inflammation. AC-11 has a positive effect on Lymphocytes, increasing their life span and enhancing the body’s immune system. In a nutshell, AC-11 can repair the very DNA within us which will prolong the aging process. Optigenex is a great resource if you’d like to read more on the science of AC-11, where it comes from, and how it’s harvested. They are the only company who manufactures pure AC-11 from the Brazilian rainforest. They sell patents on AC-11, they do not sell products. There are only and handful of companies licensed to use AC-11 in supplements. Pruvit is one of the exclusive license holders and includes AC-11 in their exogenous ketones and fat supplements. Pruvit brought exogenous ketones to the marketplace in Dec. 2015 and has released some pretty awesome new formulas which include the addition of AC-11. If you’re not familiar with Pruvit’s exogenous ketones supplements, you can read my Pruvit review here. Ketones are a hot topic of conversation right now since drinking one serving of therapeutic ketones literally biohacks your body into ketosis in under an hour, without having to adhere to a strict ketogenic diet. Keto Kreme with FFT™ (Functional Fat Technology) – Have you ever heard of “fat coffee”? Keto Kreme is a healthy fat supplement containing MCT (Medium Chain Triglycerides), coconut oil, and four different patented collagen blends. MCT provides a brain boost, promotes ketone production in the body and also ramps up fat loss. Keto Kreme is a powder you simply mix with coffee or tea that tastes delicious. Collagen also has many anti-aging benefits since it’s the building block which holds our skin together. Keto Max & Keto NAT – All of Pruvit’s Keto Max and Keto NAT flavors contain AC-11 (under the trade name C-Med 100 DNA Repair). Keto Max flavors taste delicious! They make a favorite for everyone, my faves happen to be Raspberry Lemonade and the Key Limeade! I’ve been drinking Pruvit’s Keto OS daily since Jan. 2017, and I love the way I feel on ketones! I lead an active lifestyle, try to eat clean (I do eat low carb) but don’t follow a specific or restricting diet. Ketones have helped facilitate some fat loss for me which I’m quite happy about, but I love the way they make me feel and they give me energy! Ketones suppress my appetite, reduce carb cravings and make it easier to make healthier choices with food. And I have to say, my skin has never looked better! I also do some intermittent fasting on ketones and never lack in energy. In fact, I’ve had some of my best workouts fasted on ketones! The new AC-11 DNA Repair found in the latest Pruvit products is just one more reason I’ll continue to drink them because I want all the anti-aging benefits I can get. This content is not the opinion of Pruvit Ventures, Inc. Pruvit Ventures, Inc, is not responsible for any of the information, view, or opinions expressed on this page. Please visit their official site for details.